Blog This! is a Google Chrome Extension introduced recently for bloggers. The blogger extension lets you post to your blog from any webpage with just one click. It saves time for bloggers to do other things. Click Blog This! 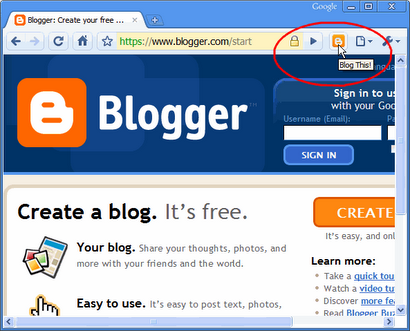 to get Google Chrome extensions page where you find Blog This! Install button as shown in screenshot. Click Blog This! Install button and it will be added to browser toolbar with in one minute or two. Use BlogThis! and enjoy blogging. Share your comments on " Blog This! Extension For Bloggers". It makes us feel happy and write better.